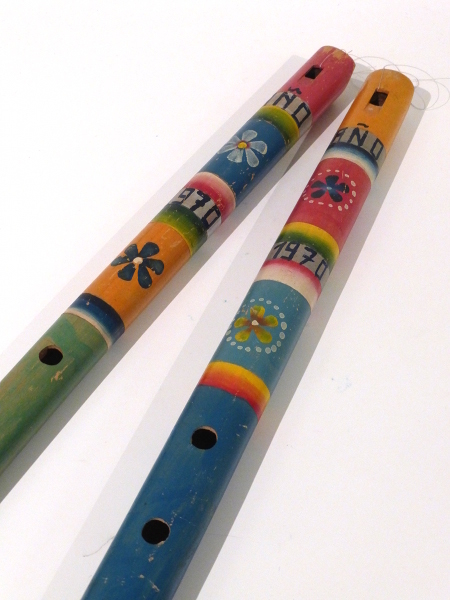 The Quena (quenchua: qina, sometimes also written ‘ken a’ in English) is the traditional flute of the Andes. Traditionally made of totora, it had 6 finger holes and one thumb hole, and is open on both ends or the bottom is half closed (choked). To produce sound, the player closes the top end of the pipe with the flesh between his chin and lower lip, and blows a stream of air downward, along the axis of the pipe, over an elliptical notch cut into the bed. It is normally in the key of G, with G4 being the lowest note (all holes covered). It produces a very ‘textured’ and ‘dark’ timber because of the lenght-to- bore ratio of about 16 to 20 (subsequently causing difficulty int he upper register). Quena is mostly used in traditional Andean music. In peru, one sees white quenas made from the leg-bone of the condor. This pair were made for the tourist market and lack the thumb hole.